Let’s face it. Marketing is becoming a much more challenging and complex profession. There’s more pressure to achieve ROI, stay on top of new technologies and get your arms around a digital landscape that’s absurdly fragmented. And now marketers have another thing to grapple with: brand fraud. Cybercrimes like brand fraud cost companies $473 billion annually, or $1.3 billion each day, according to the Ponemon Institute. It happens when scammers register a domain using your brand name – or a close iteration of it – and create fake sites that confuse customers, obtain personal information and essentially steal your revenue. This is nothing new — but the problem is making headlines and getting much worse, since there have been over 750 new top level domains in 2015 (such as .nyc, .club, .bank and hundreds more) and monitoring all the permutations of possible URLs is generally not doable. Most online reputation solutions only address the visible portion of the web– monitoring a company’s listings, ratings and reviews. They do not address “the dark side” of the web– security problems and brand fraud that begin with fraudulently used domains. Scammers create fake sites to confuse customers, run phishing scams and install malware and viruses…all of which damage brands. A fake Bloomberg site was created this summer – with full Bloomberg branding and content – and put out fake news about Twitter’s stock. The stock went up on the false news, leading to an SEC investigation. WellsFargoAutoLoans dot com is being used by a profiteer to sell a credit product. DO NOT GO THERE. In writing this article I went the the site, which tried to infect my Mac with a virus. Nikestore dot xyz is a malware site that sells fake goods and may attempt to deliver malware. DO NOT click on it. IT people may own the domain registration process, but marketers are on the hook for brand integrity. 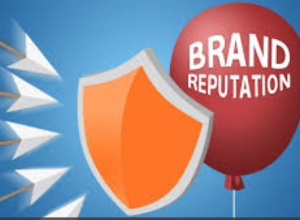 Lawyers can fix the issue, but they may not be looking for brand fraud proactively. We’ve come across a company that helps marketers and other professionals with these issues, DomainSkate, and are happy to say that are now a client. DomainSkate protects companies against brand fraud. Every day, they monitor millions of domains across the web and find unauthorized and misleading uses of a company’s brands—and provide the tools to resolve these issues and reclaim lost revenue and traffic. The issues I’m describing can take down companies. 60% of small businesses affected go out of business in six months and large companies also face threats. 94% of the top 500 domains are one keystroke away from a brand fraud according to a Stony Brook University study. So yes, proactive brand protection is one more thing you have to handle. But the consequences can be dire if it’s not done.